I have been working on a map for over 3 weeks now and so far everything had worked perfectly. Today I added some dynamic lights with lamps that turn on at night (not sure if they are the cause) and the game started crashing when loading my map. Tried validating and finding errors, but I'm not sure if I'm doing it right. Can anyone help with resolving the issue? For a moment I though it might be because of duplication of the lights (I copied the first one that I made to save time). I also added some FX here and there, before it started crashing. (dust, hot air refraction, etc) Could they be the reason? try fixing the errors and see if the game doesn't crash. but remove any object that is connected to the error and see if the game still crashes. that's the first step to see what's crashing the game. duplicating dynamic lights should'nt crash the game, ive done that multiple times. if the game still crashes after removing the error giving objects, then that's a tougher thing to try and fix, but i's start with that. i think so, i dont know where though. 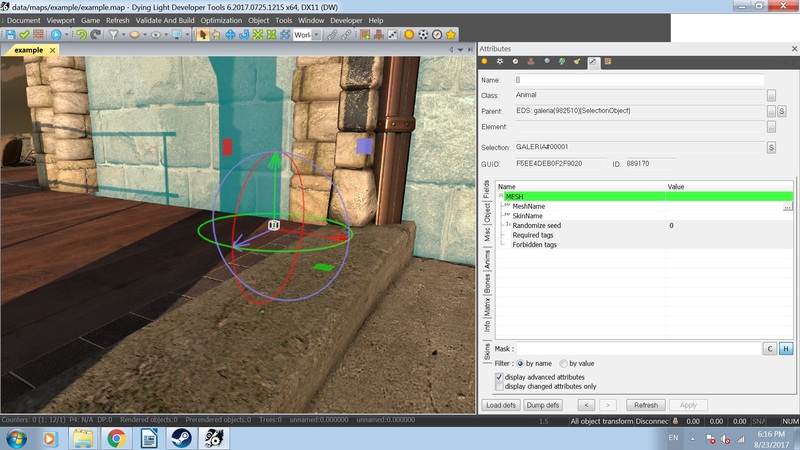 All meshes with errors were removed, left only one global envprobe, removed my new dynamic lights and it still crashes. I am getting a MapStart [HomePoint/Spawnpoint] error in the quest editor. Could that be causing the crash? My original spawnpoint is still there though. What would be the right way to add one of those? Update: fixed the spawnpoints, by adding two Spawn Points and giving them names as in the quest editor. Map still crashing the game while being loaded. Also, is it possible to "migrate" to a new map and keep my terrain? I did some quite complex terrain editing with hills and wouldn't want to lose that. but how many spawn do you have in total? I got two spawns with the required names in the quest script. Here's a link to my map. 2. remove the FX's that are giving the errors. 4. add a spawnpoint with it's default setting (dont mess with the settigns of the spawn when placing it on the map). sorry i can't test you map, i'm testing and fixing mine at the moment. you should not be able to load it in the tools. So check by elimination process. I am trying to do that now, it's going to take a while. Posted all objects to a new map once, it crashed in the same way. I suspect it might be caused by a grass mesh. Hopefully I will get it all fixed and post a video of some of my complete work soon. any movie actor that is linked with a movie in any object group. tool or when you test ingame. If you have movies, you can export them through the movie tool . Just manage to locate the problem: what I did was to delete large selections with models on the map to find out which area is causing the crash. It was this invisible object. Glad you fixed the map. Dying Light should be avoided.